Fred and Ethel – Why Should You Care About Market Structure? Browse: Home » 2013 » August » Fred and Ethel – Why Should You Care About Market Structure? – What individual company’s stocks should we invest in? What are their earnings prospects and risks? – What mutual fund managers should we allow to invest our hard earned money? What’s their track record? – What is the right mix of safe investments – like cash and bonds – with riskier investments – like stocks? In past times, Fred and Ethel never gave a single thought to whether their stocks traded on the NYSE or the NASDAQ, and how. They also were unaccustomed to the word “glitch” being a regular term in the investing/trading vernacular. In the last few years that has changed; to their credit they have made it their business to understand things like rebate arbitrage, latency arbitrage and multiple speeds in the market, mini flash crashes, and even dark pools. Fred and Ethel called again yesterday. They had heard quite a bit about market structure during the past week, including The Goldman’s HFT algo (whose errant trades got busted! ), the Flash Freeze, as well as a high profile stock exchange merger (BATS/DE). They had some questions. Fred: Thanks Boys. It seems like things that go bump in the night are going bump in the night more frequently. This bothers us, I guess. S&J: Well, you are right. Little things and perhaps things not so little are going wrong in the market’s structure more frequently. It is because the market’s plumbing has become very, very complex. We feel you are right to be concerned. Ethel: But this hasn’t affected our retirement savings has it? I mean I listened to a few bloggers say that things like the Flash Freeze are inevitable and no big deal. Other folks on the TV said we shouldn’t even pay attention to the crazy algos, mini flash crashes, and exchange glitches. Some say that folks like you are fanning flames unnecessarily. S&J: We hear that a lot Ethel! Frankly many of those who say to not worry about all of these things – failed IPOs, runaway algos, and trading glitches – say that because they have a stake or desire to keep things as they are: complex. Their business models like that complexity. Fred: What do you mean “their business models like that complexity”? S&J: Well, we mean that the current complex plumbing – the network of numerous stock exchanges and dark pools owned by for-profit entities, with different trading speeds, – allows them to make money off of your investment ideas (or your investment managers ideas) one little cut at a time. You remember our discussion of latency arbitrage, right? 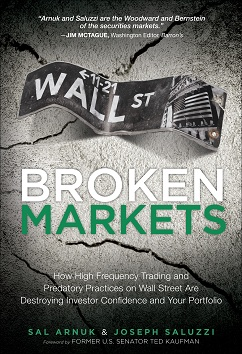 Slower orders get picked off systematically in the market by faster proprietary trading engines (HFT) run by hedge funds and even “market makers” in complex silos. Your orders get purchased by these firms, who make small amounts of money trading against them. Fred: But haven’t trading firms always made money by trading off of our orders in the past? Like the wide-spread NASDAQ market makers in the 1990s for example? What is different? S&J: Fred, we will tell you the difference. First of all, while in the past trading firms made money by using wide spreads, those spreads were disclosed – the vig if you will. Today that vig is nebulous, created systematically, and done so in a hard-to-understand labyrinth. Automated computers automatically touch everybody’s orders, and they do so in these fragmented destinations. It’s often impossible to detect and understand how they operate, and how they are forcing you to leak your savings pennies at a time (the vig you are paying) into their engines. Second, these programs generate insane amounts of quote traffic, stress this labyrinth, and create increasing instances where the entire market can get shut down, and incur instances where the markets do not reflect true value of the assets trading on those markets. Ethel: You mean like NASDAQ shutting off trading for three hours? S&J: Yes, like that, and also like when algos temporarily make stocks trade at crazy prices – like with mini flash crashes, or the runaway Knight algo of last year, or like with the Everbright Securities HFT algo that within minutes sent the Shanghai up 6% and back down again, as well as the Goldman HFT futures glitch early last week. Did you see where JPM traded during that glitch? Ethel: I heard they canceled Goldman’s options trades though. Weren’t the bad option trades canceled? S&J: Yes – another story. I mean Goldman did not even have to incur the losses from that havoc. But what if you sold your shares of JPM during that period? What if you sold a banking ETF during that period? You got crappy pricing and were disadvantaged. And with regard to the Flash Freeze, we all were very lucky! Imagine if you wanted to sell your stocks and couldn’t for hours during a period of high stress in the markets? Like say if the FED raised rates or hinted at stopping an easy policy? If that issue occurred on a busy day instead of a dead August day, would the markets have been able to reopen? Will such a shutdown be no big deal then? Fred: What happened exactly with the Flash Freeze? Was it an HFT issue or a market complexity issue? S&J: We wrote this blog post on Monday – The Real Story of Why Nasdaq Halted Trading. Nanex also dissected the events in this article. Essentially Nasdaq runs the public SIP – which is the aggregator of all quotes and orders from all of the public exchanges. Their SIP aggregator was getting clogged up by quote bursts from ARCA. Nanex says ARCA kept trying to connect and deliver their quote bursts to NASDAQ, but they weren’t taking. So they kept resending – only each time they were sending huge bursts of older quotes as if they were real time live orders – which they were not. These old orders and quotes were moving the markets! And read this article – NASDAQ and NYSE are each blaming each other. It’s like May 6th 2010 all over again. So it is really a plumbing and market complexity issue. Think of all those exchanges, in all of those stocks, sending millions of orders and quotes and information to one processor – the SIP. Think of the SIP running slower – by design mind you- than the private faster feeds that the exchanges sell to HFT clients. Think of the SIP getting bogged down and clogged to the point of freezing up. Does this sound like a good design to you? Fred: So let me put it in lay terms so I can explain it to the boys down at the American Legion. We are harmed by a structure that is complicated because a) it bleeds us with thousands of small cuts, b) the faulty design of this mess can mess up prices in the markets so that our stocks don’t reflect true value, and c) the design of the mess can actually cause the whole system to crash – where we won’t be able to access the marketplace. By the way, why would any corporation want to come public and have their stock subjected to this mess? I bet you that is why new small companies don’t come to the market also. And this stinks for us because we like investing in the small companies! They grow. Often a lot more than an AT&T or a Wal-Mart. S&J: Bingo Fred. 13 exchanges and 50 dark pools, with different speeds and technologies, all being filtered into a central point of aggregation, which is run by owners of the exchanges, is way too complex. The SEC should be working on how to get the markets less complex with less fragmentation. And that will have a long term effect of encouraging more investable ideas to come into the markets. Who knows – those ideas might even make the economy grow! Ethel: Wait… we hear that two of the exchanges – BATS and Direct Edge (DE) are merging. Won’t that help? Isn’t the free market working? I mean trading volumes have fallen off a cliff in recent years, so we should be seeing exchanges and dark pools merge, no? S&J: Ethel, that is most curious. In a free and unencumbered marketplace we would expect to see exactly that! But the combined BATS/DE has no intention of combining their trading destinations. They will keep all four of them. Ethel: But that makes no sense. Diminished order flow… you would think it costs money to run those exchanges, and they are merging to save money! S&J: You are astute! You would think that. This shows you that their most profitable customers – the HFT guys – love the fragmentation. Keeping the fragmentation will make BATS/DE more money than the cost savings from consolidating the engines. I mean think about it. Who likes a market where orders trade in 60 destinations – you and Fred? Your mutual funds? Or high speed traders that can make fractions of pennies systematically by arbing all those destinations, with their various speeds, rules, special HideyNotSlidy order types, etc. By the way, the dark pools also have not consolidated – which makes no sense. It would be much better for the markets if there were less stock exchange destinations, as well as dark pool destinations. It might not be better for the economic interests who own them and make the complexity and rules that allow them to still have a place. Ethel: This is very, very short-sighted and silly. You would think the SEC would understand the problem and try to correct this complexity and fragmentation. S&J: You would, Ethel. But remember they helped create it first of all. And secondly there is a lot of lobbying in Washington that slows that process down. The regulators instead keep trying to address all of these issues in a reactionary fashion – with Band-Aids, such as a circuit breaker here, some LULD trading volatility bans there. And even with a REG SCI – which will finger-wag at the exchanges and tell them to get better technology, but not even oversee the HFT firms employing the algos. And all of their band aid solutions seem to have the effect of increasing the complexity – again, which is the root of the issue. We wrote another blog post yesterday, titled A Simple Approach to Solving the Market Complexity Problem, and we hope the SEC reads it. We think that dark pool disclosure, a trade-at rule for dark pools, and eliminating payment for order flow – including maker-taker pricing, will go a long way to reducing the complexity and fragmentation we all are struggling with today. Fred: This reminds me of a dam that is springing little warning leaks. And we all keep trying to just stick our fingers in the leaks, when we should be fixing the dam, or even more important, address the source of the rising water. S&J: Hmmmm. Wise Fred. Wise.